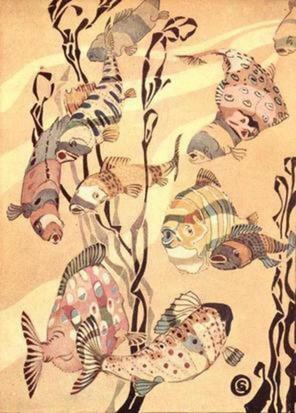 “A meeting of all the fish in the sea was called.” Illustration by George Sheringham. Published in Canadian Wonder Tales by Cyrus MacMillan (1918), John Lane, the Bodley Head. Read Canadian fairy tales and legends from Cyrus MacMillans’ collection of Canadian Fairy Tales, and Zitkala-Ša’s Old Indian Fairy Legends. Jump to full list of Canadian fairy tales. About: Canadian folklore and fairy tales were influenced by region and ethno-cultural groups around Canada. With Inuit-Indian folklore, French Canadian and Anglo-Canadian folklore, to name just a few, the breadth of folkloric history in Canada is a vast and colorful one. The folk tales are filled with legends of the Sasquatch, Ogopogo and other forest monsters. Magical tales of werewolves, witches and devils are favorites among the stories for children and adults. From 17th century explorers, trappers and traders, missionaries and migration myths, the folklore is rich in history, customs, and beliefs. The strong oral traditions in the early 1900s helped Canadians establish a national identity, and fortify their cultural ties. With influence from over 70 oral traditions from around the world, Canadian folk tales cannot be classified easily as their roots can be traced all across Europe and even back to Medieval times. Canadian folklore and fairy tales are amusing, clever and fun-loving tales that transform the ordinary into the extraordinary. Many of the Canadian Native American tales are creation or origin myths that have strong themes of nature and the seasons similar to Native American folklore throughout the Americas. Like most countries, storytelling in Canada is deeply rooted in tradition and cultural identity. Collections like Professor Cyrus MacMillan’s Canadian Fairy Tales saved these great relics of Canadian history. American author, Cornelius Mathews collected Native American stories from across the Americas and published them in his Indian Fairy Book. An outspoken advocate for women’s equality, and Sioux writer, Zitkala-Ša, collected and published Native American tales in her book, Old Indian Fairy Legends.